The withdrawal of benefits has resulted in people losing their homes, relying on food banks and resorting to survival crimes, according to new research by Crisis. Homeless people are doing everything in their power to fill the gap left by benefit sanctions. 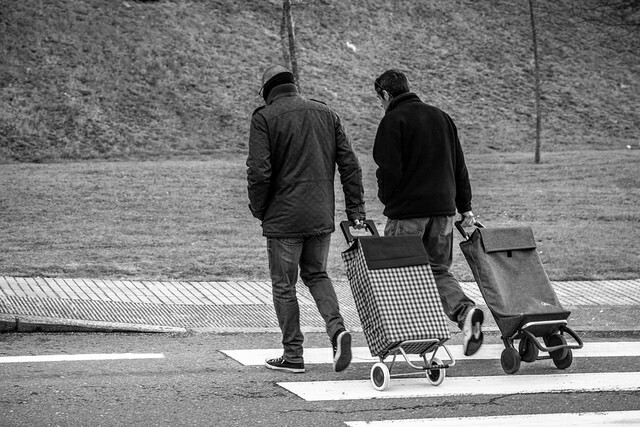 In a recent report titled ‘Homeless people’s experiences of welfare conditionality and benefit sanctions’ the national charity explored the impact of benefit sanctions on the most vulnerable in society. The report is based on a survey of 1013 people from homeless hostels and day centres across 21 cities. The study made use of research from Sheffield Hallam University. 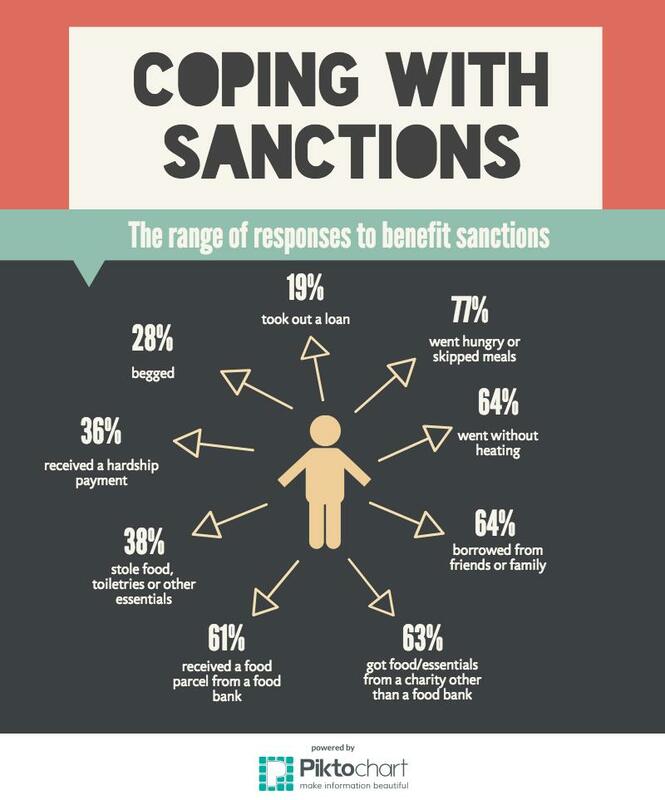 It found that sanctions had a series of ‘unintended’ impacts on respondents’ lives, including debt, hunger, strained relationships, and mental and physical health problems. The Secretary of State for Work and Pensions, Iain Duncan Smith said the report was “misleading” and contained “inaccuracies”. Respondents employed a range of strategies to meet their daily needs, as a direct result of having their benefits sanctioned. Just under 40 percent of respondents resorted to stealing or shoplifting food, toiletries and other essential items. 28 percent resorted to begging. “The report finds those already homeless going hungry and being forced to ‘beg, borrow and steal’ – this is both inhumane and counter-productive,” said Chief Executive of Crisis, Jon Sparkes. Respondents facing benefit sanctions generally considered shoplifting and begging as desperate measures. 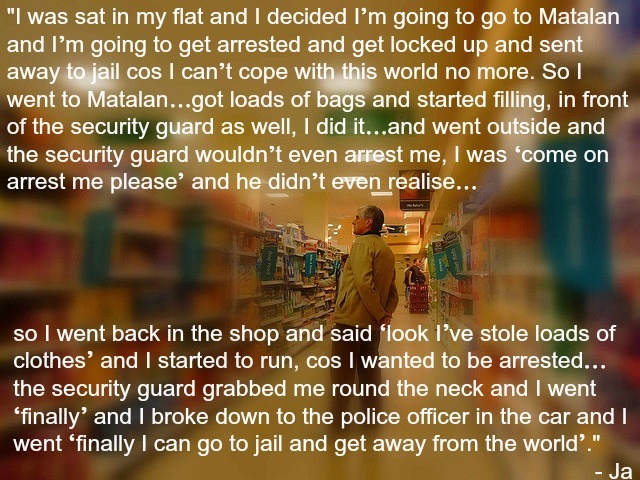 Most of those who admitted to shoplifting emphasised that it was a one-off occurrence. The text of this case study was provided by Crisis. 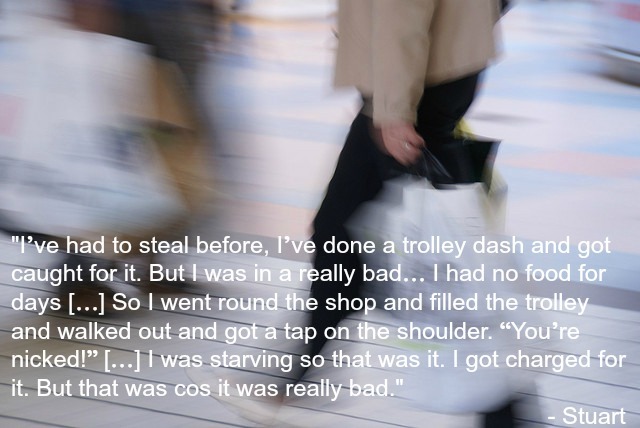 Many of those who admitted to shoplifting or begging said it was necessary to do so. Others believed they had ‘nothing to lose’ and attempted to get caught in the act of shoplifting. This is evident in the case of Ja (below), who believed life in prison to be preferable to the destitution he was facing. The report recommended steps to identify homeless people and suspend the rules until their housing situation is resolved. It proposed introducing a new financial assessment to determine if a sanction is likely to result in destitution or homelessness. It suggested steps to help homeless people into work and a review of the effectiveness of sanctions in moving homeless people into work. “The report clearly shows that this flaw in the system is leaving people homeless and calls on the DWP to fix this issue once and for all, and to report on their progress,” said Sparkes. In October this year the Government announced it would trial a ‘Yellow Card system’ whereby claimants are given a 14-day warning period before a sanction is applied. The claimant can use this period to give a justifiable reason for failing to meet the terms of their Claimant Commitment. The Department for Work and Pensions will review this information before deciding whether a sanction is appropriate. The Department is expected to publish the results of this trial in early 2017.